The stars, the moon, our solar system. All the toys that cover the night skies above us are here. Enjoy images of all the phases of the Moon with this 45 piece Moon sticker set. Each sticker is a different phase of the Moon from New to Full, and every phase in between. Each sticker is 1-1/2" diameter with an adhesive backing. Great for customizing phones, tablets, or anything that strikes your fancy. Enjoy your ice cream just as the Astronauts do � the freeze-dried way! Astronaut Ice Cream as well as other freeze-dried food items, have been aboard space missions since the early Mercury Missions. 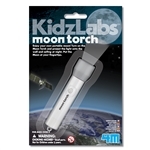 They continue to be used on NASA missions today. 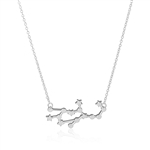 Show your love of the constellations of our stars with this represenation of the 'Teapot' portion of the constellation Sagittarius. Silver colored from zinc plating and is about 1" wide, and 3/4" tall on a 18" silver-colored chain with clasp. Show your love of the constellations of our stars with this represenation of the constellation Capricorn. Silver colored from zinc plating and is about 1" wide, and 3/4" tall on a 18" silver-colored chain with clasp. 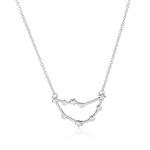 Show your love of the constellations of our stars with this represenation of the constellation Virgo. Silver colored from zinc plating and is about 1-1/2" wide, and 3/4" tall on a 18" silver-colored chain with clasp. Contains 16 1-1/2� to 3-1/2� stars. Adhesive included. Stick them on your wall or ceiling and 'charge' them up with room light or a flashlight for a minute. Turn the light off and watch them glow! This set includes 10 stars of various sizes and one 11" crescent moon.